Amidst the uncertainty and anxiety surrounding the future of Hong Kong's political state, is a slant of sun when it comes to freedom of press -- social media. Yes, thank heavens for Facebook, Google and the World Wide Web. Social media, the wide reach of the Internet and growing accessibility of wireless has created new potential of a growing and much-needed alternative media. Media scholars define alternative media as providing a perspective or information that may be different than what is presented in the mainstream press. In addition, their revenue stream is separate of government or corporate interests. The Internet and social media platforms ultimately serve as forums for voices and perspectives that would otherwise not be heard. Facebook in particular has played a major role in extending Hong Kong's protests beyond its borders. During the most intense days of Hong Kong's Occupy Central protest and what has become known to the world as the "umbrella revolution," my students in Hong Kong sent me a barrage of on-the-scene updates via WhatsApp, Facebook Messenger, and email. There was a flurry of Facebook posts whether they were stories, photos, video snippets and commentary. Many of my friends and students in Hong Kong switched their Facebook profile pictures to yellow ribbons or umbrellas in show of solidarity and support. Indeed, Hong Kong is one of the world's most wired cities with an Internet penetration upwards 5.3 million people. Hong Kong also leads Asia in mobile Internet usage, with 96 percent of smartphone users using mobile Internet service on a daily basis. This is good news considering the dark cloud that looms over Hong Kong's future. In this city of 7.5 million the future of universal suffrage remains uncertain, and the standstill between a generation of young people and the Hong Kong and Beijing government continues. The perception of declining press freedoms is very real especially when it comes to Hong Kong's mainstream or traditional media (Sing Tao, Ming Pao, Oriental Daily, TVB and RTHK to name a few), which dominates the media landscape. In my recent years of living in Hong Kong (2010-2013), there was growing concern of press censorship in a city that has long been known and yes proud of its freedoms, economic, social and political and yes press. According to the latest Hong Kong Journalists Association (HKJA) annual survey of journalists, 79 percent believed that self-censorship had risen since 2005 while 36% said that they, or their supervisors, practice self-censorship, mostly by playing down reports that might anger the central government, their advertisers, or company owners. The good news, unlike Mainland China (where Facebook and Twitter and a myriad of other social media is banned), social media is freely and easily accessed. The city has one of the highest numbers of users when it comes to Facebook, along with WeChat, WhatsApp, Sina Weibo not to mention a myriad of mobile apps. As the umbrella revolution proved, social media played a significant role in the sharing and dissemination of information, making news and protests borderless and almost universal. The fight for suffrage and to be heard appeared a common thread that crossed time zones and continents. Moreover, a wide range of alternative media, at least a dozen, were either launched by the umbrella revolution or actively covered it. "At the moment the protesters are blaming the traditional media for their pro-government and biased reportage, this has led to a sharp rise of alternative online media," wrote Tinyan Tse, a former student of mine and now a graduate student at Chinese University of Hong Kong. There's the resurrection of The House News, a Huffington Post look-alike blog that started in 2012, but shut down last July after the editor-in-chief attributed their demise to too many roadblocks from the government who treated them unfairly and differently than they did mainstream press. In the past month the blog was resurrected as The House News Bloggers where there are commentators who freely express their anti-government viewpoints. A recent post for example, stated the kid of dialogue the young protestors are hoping to have with the Hong Kong government. The list included government accountability, establishing democracy and equal rights and abiding by the principle of "one country, two systems." There are websites such as Hong Kong Peanut that offer a more radical standpoint. In its introduction to readers it noted that continued peaceful protests were necessary, and warned of government intervention using force to avoid a possible repeat of June 4, 1989. Political interest groups such as Civic Passion have also used the power of online to launch their own media. The pro-democracy group, who believe that Hong Kong's cultural identity and independence is being threatened by mainland China, publishes a monthly newspaper called Passion Times and also runs an online news website called "Passion Times." The newspaper's Facebook page is very active with some 216,731 likes. Other alternative media have used social media and websites to organize the movement. 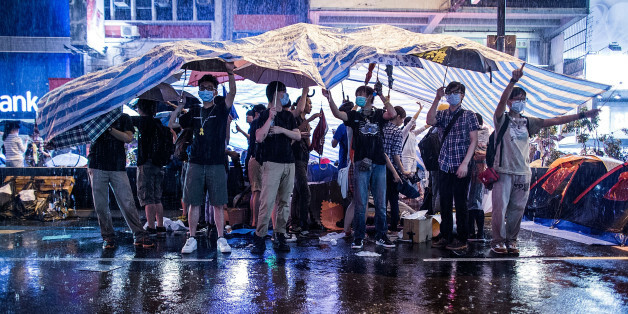 UmbrellaKeyboarder launched as an online archive of photos and stories in both English and Chinese on the umbrella revolution. The site's form of protest is in systematically documenting and almost preserving the event through photos and text and serving almost as a repository of coverage. "We believe in the calm rational analysis, we will see an umbrella movement of the enemy is not in Hong Kong, not the police, but that does not respect the opinion of the political system," the UmbrellaKeyboarder's descriptor on its webpage reads. So the young people in Hong Kong can consider looking towards the bright side. The media landscape has been expanded and extended to allow for more voices due to the power of the Internet and social media. Hopeful indeed.